There is an inimitable semblance between Beautiful Paintings and Football at Arsenal. It is this that made me do this interview-based feature article on three of the brightest talents on this planet. They are all amazing artists as well as die-hard Arsenal Fans. We’ll get to know more about their paintings, love for Arsenal, the relate between Arsenal and Paintings and much more in this THT Special. Tighten your seat-belts for some fun. Kerovin Black (KB) – She is originally from Czech Republic and lives in London, UK now. She has been into sketching/painting from a very young age. It has been a hobby for her so far but she would love to pursue it as a career option. So far, though she has managed to sell some of her paintings, the exercise wasn’t on a professional level which she would prefer. Nadezda Sergeevna Son (NS) – She hails from Belarus. Having started painting as early as a 5 yr old, painting on children’s books and on walls’ of rooms, she is now employed as an Architect. When her parents realized that she was a unique talent, she was sent to two schools at tandem, ‘Rhythmic’ and general school. After graduating from two schools, she went to a University and got her priorities right. Gurleen Kaur (GK) – She lives in Delhi, India. She took up sketching from the age of 14 and hasn’t looked back since then. She is currently studying ‘Graphic Design’ at a school which involves some form of art-work. She does get paid for assignments involving art-work. For her, sketching happened before she became a fan of the club. But, it was only after she started following Arsenal, when she combined both her ‘love’, getting much more satisfaction from the kind of art involving the club and its’ players. 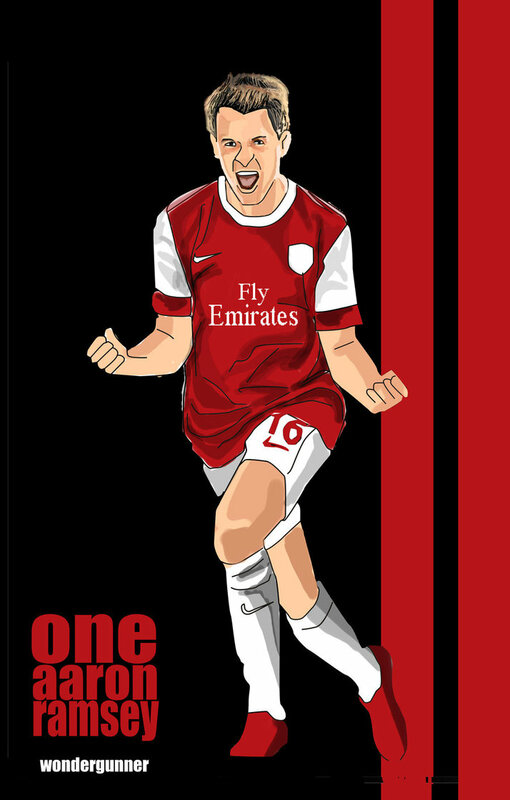 SM – First and foremost, there is one thing common between the artwork of all of you – Arsenal. Did painting happen first or Arsenal? And since when? KB – Well, I started pretty young. So it was painting and then came Arsenal! I must say I used to hate football; just couldn’t stand it until my brother-in-law gave us (me and my husband) tickets to go see Arsenal play live. Well, since then everything changed. That was – I guess 3 and half years back. NS – I used to watch football from a very young age. But I didn’t choose Arsenal straightaway. It is quite funny, but the first match that I saw on TV – was the Champions League Final Manchester United-Bayern Munchen – 1999. It was a great match to start with. Perhaps, that was the moment when I fell in love with football once and for all. GK – It would be the Champions League match against AC Milan! It was late in the night when I was watching the game. Champions League matches are really late here in India! I’ve been following Cesc Fabregas since the day he joined Arsenal. And when he scored that famous goal in that match, I was screaming and running all over the house, I had goosebumps! I had never known that such emotions exist. I had my final exam the very next morning and I still remember that I couldnt sleep after that match, that night! SM – Since when have you been supporting the club? Any particular match/player/moment that you can recall which ‘discovered’ the fan in you? KB – What happened really was, my husband who is a life long Gooner made me go to pubs with him to watch the games; At first I hated it but slowly it grew on me, and let’s face it – I’m a girl and Arsenal players are handsome boys so that was a bonus, especially Cesc! It all pretty much went from there. And watching a match live is a completely different feeling. The atmosphere just takes your breath away and you can then only fall in love with this team. NS – I think it was the season of 2007-2008 when I saw an interview with Arsene Wenger. This was when it all started. The Frenchman made me fall in love with the game, and eventually Arsenal. GK – The final against Barca wherein we lost. 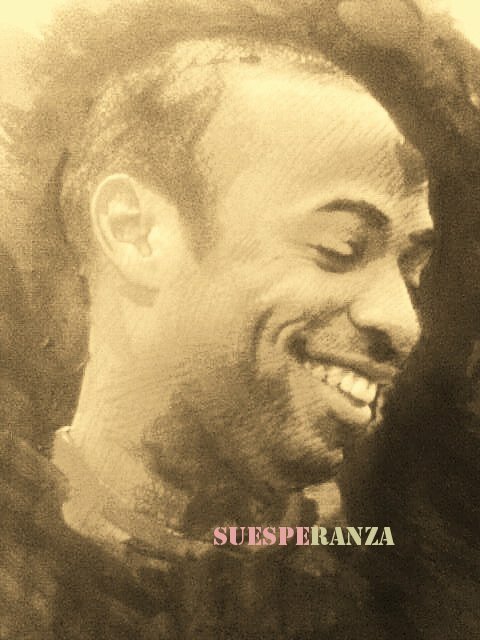 The sight of Thierry Henry sitting down, shaking his head, not believing what had happened, the sight of the team passing by the trophy with tears in their eyes – I think I would have never cried as much in my life as I did that night.I just wouldnt stop crying! But only in moments like these you do realise that it’s not just a football team you’re supporting, it becomes THE reason to live! SM – Into matters ‘Arsenal’, which is that one thing missing in this Arsenal side that you think can make them champions? KB – That is a good question, guess all they needs is a bit more self belief, and bit more Cesc style attitude from all the players in the team. You can see he wants it and he gives his best, even though he may not be 100% fit all the time. I’d like to see more of that from the others! And, also the Boss needs to spend some money, bring in some good players with experience. NS – I think we all want them to become Champions. But, unfortunately, sometimes we do not show enough fighting spirit and faith in ourself. There should be a belief that we are the best and play in accordance with that. I think it’s a matter of psychology, it’s all in the mind. GK – On paper, we’ve got a fantastic side, much better than United any day! We need to start killing the games off as we have failed to do so over the past few seasons. And for that, we need to be mentally stronger than before. If that is achieved, there’s no stopping us! SM – Are you fine with a new manager with a different philosophy that is far away from the ‘Beautiful Football’ employed at the club? KB – I really don’t think a new manager with a different style of football would do any good to the team, since all our players are used to this style of game. But there is one thing that is for certain, something has to change! And let’s face it – people love to watch Arsenal for their style of play if they perform the way they are expected to. NS – I find it really difficult to answer this question. For me, Arsenal meant being managed by Arsenal Wenger from the beginning. It is very difficult to think of any other manager as of now. GK – Nope, I’m not fine with that! The reason I started supporting Arsenal was the brand of football that Arsene Wenger had established at the club. If I really wanted to just see the team winning trophies at the expense of the quality of the football, I would be a United supporter! SM – Now into a bit of ‘paintings’ – What do you enjoy more – Visualize and sketch or Observe and sketch? What is the average time taken to complete one sketch? KB – It is hard to say, depends on what sort of tools I’m using and what mood I am in, there are other factors too! But I can make a digital painting as I did the one of Cesc in around 5 hrs. Then there are those that need their own sweet time like the painting of Bacary which took me over a year to finish (on and off). If it is a pencil drawing, guess, it would take a little less time. NS – To be honest, I can not come up with sketches from my imagination. My imagination is not well-developed I guess. Haha! I know, it sounds funny to hear that from an architect. GK – I prefer observing and sketching more than visualizing! I love to draw things which speak to people. I don’t like to draw just pretty stuff, I like to draw stuff that forces people to have a reaction towards it. The average time I take for a sketch would be around 3-4 hours. SM –Can you describe (in a few lines) the effort and tools required to complete one sketch/painting? 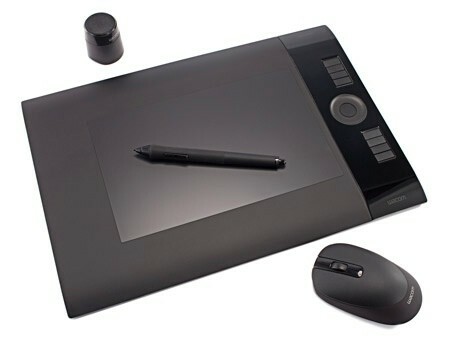 KB – Let’s say – if I do a digital painting, I need my laptop, PhotoShop and my Wacom Intuos4 Tablet (without the tablet it would be very hard to do). And then it depends on how much detail I would like to have in the certain piece. But, mostly it takes hours and hours of hard concentration! NS – Many people ask me about how long it generally takes me to paint. Well, it all depends on how I feel about what I draw. There are paintings for which I need 15 minutes, and yet there are others which I fail to produce even after a week. I can tell you one thing, if you want a quick picture from me – Ask me to draw flowers, woman with out clothes or Cesc Fabregas and it takes only a couple of minutes! 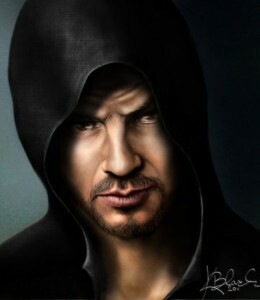 GK – Well my primary tool is a pencil and I’m more or less a pencil artist. However, I’m also into digital art, which essentially means drawing something, scanning it and then colouring it on Photoshop (c). SM –Which is that particular sketch of yours you love the most and why? KB – If you want Arsenal related – it would be Intense Cesc, which just happened as a distraction from other projects I was working on at that time. But, I guess, my most favourite would be Arnau, the connection I had with that painting was and still is very strong! NS – I am an absolute fan of fast, smeared and rough drawings. I use paint, crayons, ink and pencil. These are the set of materials that I use. I love to paint what I love, but I also love to show my drawings to people. 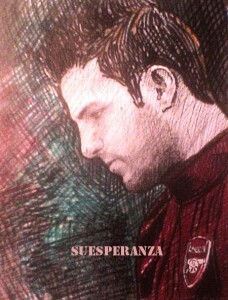 So I love Arsenal players, and express it in my sketches. For me it’s a way to get pleasure! I like it when Arsenal fans see their favorite players in a new perspective, so it is kinda cool when they ask me to draw their favorite players. That’s how I make someone happier. Isn’t it beautiful? 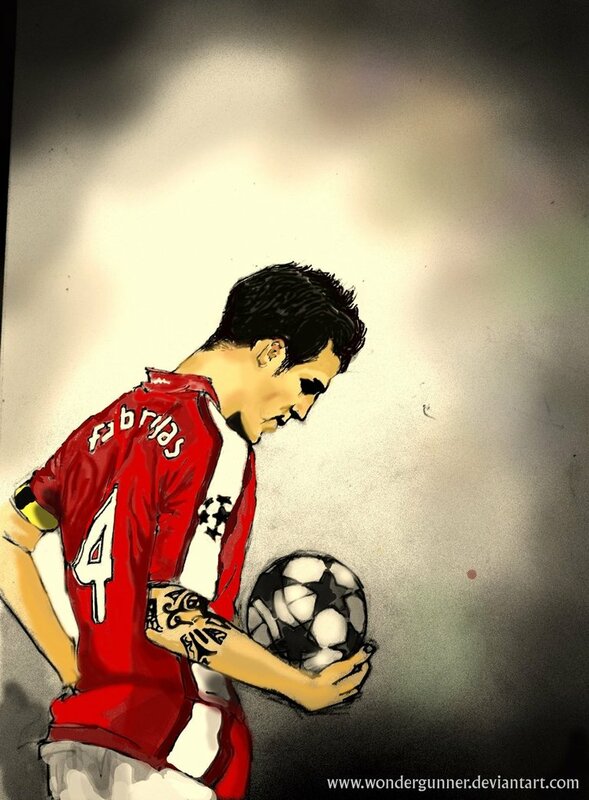 GK – My favourite sketch till now is the one that I made of Cesc Fabregas. Well, there was a lot of speculation going on about whether he was going to leave or not and people were saying some ridiculous stuff about how he never really loved Arsenal. 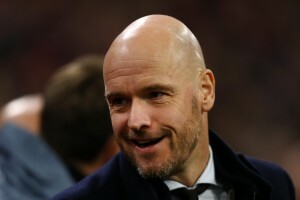 I was, of course, not happy about the kind of stuff that was being said about him, because, agreed he might have wanted to go back home, but because of that why should we forget everything that he’s done for the club? KB – It has to be red and black. Adore them two. NS – I love the warm colors. Red-maroon. Sometimes I love gray. But it is more in clothes. SM – Favorite Arsenal striker? KB – Striker? Well RVP of course. 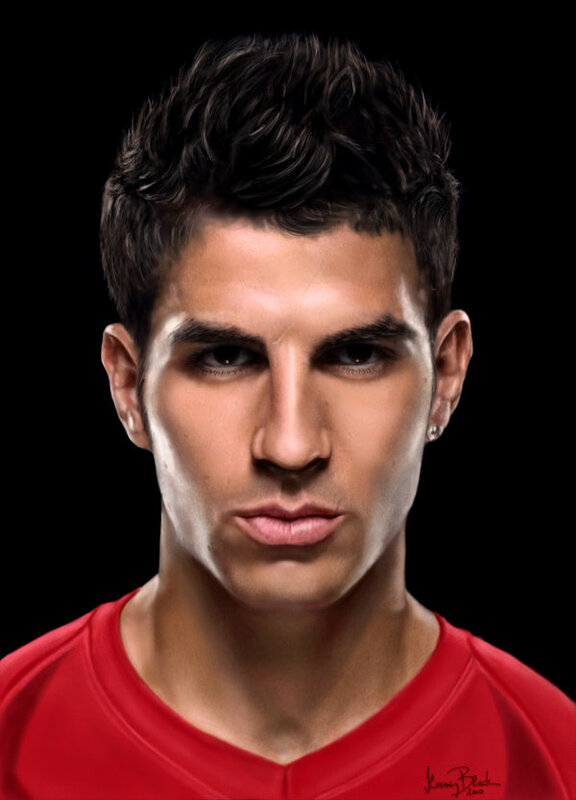 NS – Of course, RvP, but to be honest I am a fan of the middle line, I’m not too fond of striker position . GK – Robin van Persie! KB – Alcoholic would be Spanish Red Wine. Soft drink – Strawberry and Banana Smoothie. NS – I like coffee with milk. SM – Preference – Black and White Sketch or a Colored one? KB – Depends on the mood. I like both equally. NS – Depends on who is depicted in the sketch , sometimes it’s a crucial moment. GK – Black n White. SM – What is the greatest fear you have? KB – Losing my loved ones. NS – Spiders. I just hate them. They are disgusting! GK – Being a nobody! SM – Which player do you hate the most? KB – Ronaldo, no questions about it! NS – I am actually disgusted with Rooney, Crouch, Guti, Nani, and of course, Shawcross and Terry! SM – In a world of no Arsenal, what subject would be your motivation for paintings? 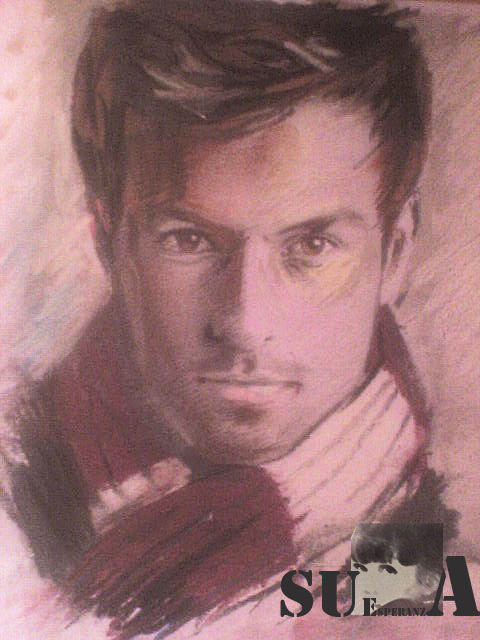 KB – I guess – film stars, musicians, family or anything else and I do sketch non-arsenal related stuff anyways. NS – The emotions that surround certain people, plants and landscapes – I love capturing them. GK – Wow! That is a tough one. I think, it would be portraits! SM – What is quickest time in which you completed a sketch? KB – Honestly can’t remember! NS – It was 15 minutes. GK – I think I had once completed a sketch in 1 hour. 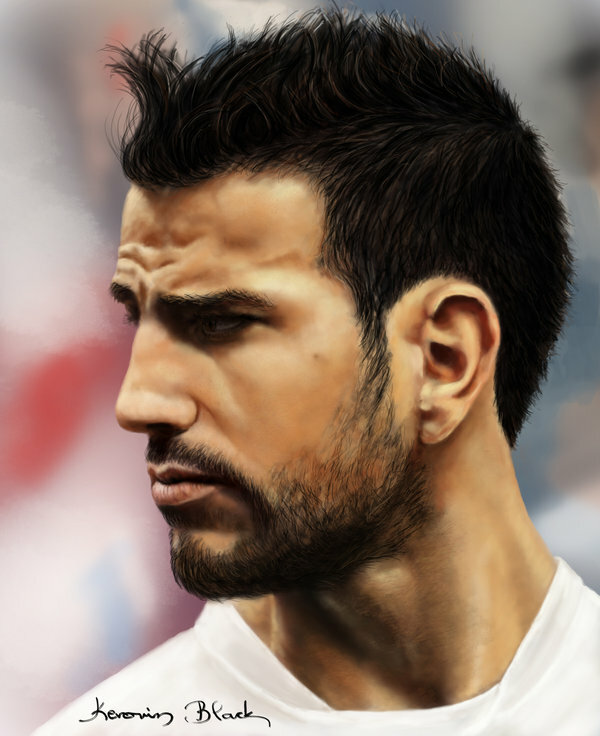 SM – Lastly, If you are to choose one between an Arsenal fan and an artist, which one would it be? KB – Well those two go hand in hand, so, sorry, won’t be able to choose one of the two. NS – Of Course, an Arsenal Fan! GK – Arsenal fan of course! Because if I wasnt an Arsenal fan, I would have never learnt to draw passionately. Note – All images used in this article are under the consent of the respective artists. Please refrain from using the images above without the permission of the aforementioned artists.